Graduating from Le Cordon Bleu with a Cuisine Diploma in 2007, Biné has since experienced success after success in his pursuit of melding French and traditional Slovenian culinary techniques and cuisine. Fashioned by Michelin star restaurants Arpège, Apicius and l’Atelier de Joël Robuchon, Biné Volčič is one of the outstanding Le Cordon Bleu graduates of 2007. His career in Slovenia, a small but beautiful central European country, is going from strength to strength. 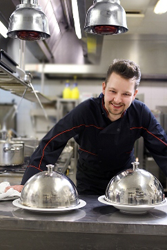 Following an initial training period in a catering and restaurant school in Bled (Slovenia), Biné Volčič decides to expand his horizons. With no knowledge of the French language, he arrives in Paris and signs up at Le Cordon Bleu. The Arpège restaurant (3 stars) becomes the next target of the young Slovenian. Third in his class, the doors of Apicius (2 stars) are wide open. Initially as an intern, then as a demi-chef de partie for a year, the former Le Cordon Bleu student spends his days in the kitchen of the famous Chef Jean-Pierre Vigato. In January 2011, Biné Volčič is invited to carry out an internship at the Atelier de Joël Robuchon (2 stars). Having created his very own culinary workshop Kitch’n’Art, Biné decides to return to his roots in Slovenia. He begins working at the Livada Prestige hotel (5 stars) at Murska Sobota, where he becomes the youngest cuisine chef in history to hold such a position in a prestigious Slovenian establishment. His menu has twice won the gold medal at the National tourism and restaurant awards (in 2009 and 2010). Today, Chef of the Gourmet Promenada restaurant in Bled (Slovenia), Biné continues to integrate the techniques learnt in France by combining them with traditional Slovenian cuisine.